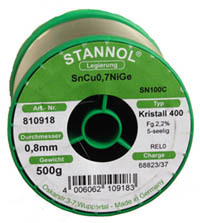 STANNOL offers a wide range of high quality materials for effective and reliable soldering. 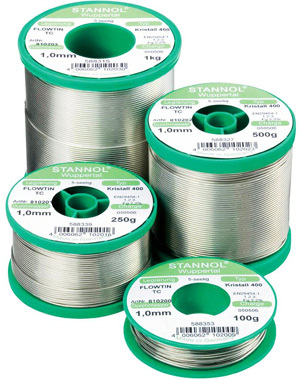 Stannol is well-known worldwide for innovative soldering wires, flux and soldering pastes that are manufactured with care and have impressive reliability. Synergy Electronics is the Sole New Zealand distributor for Stannol products. 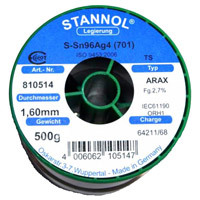 We stock 60/40, Sn99.3 Cu0.7, Arax, SAC305 & SN100C Lead Free Solderwires. 63/37, SAC305, SN100C & SN100CE Solder Bars. 63/37, SN62 and SAC305 Solder Pastes. Alcohol and Water based liquid Fluxes. 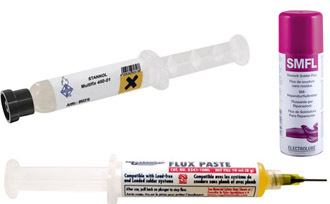 Rework Flux Gels and Flux pens. 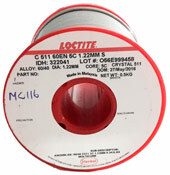 We stock Multicore Solder Wire in 60/40, SAC305, 2% Silver and Alusol. 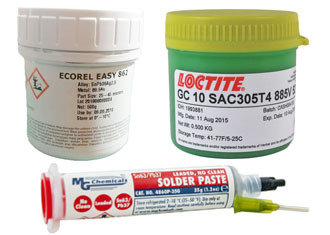 Multicore Tip Cleaner/Refresher and Multicore SAC305 T4 Solder Paste. We stock Nihon Superior 030 SN100C Solder Wire. 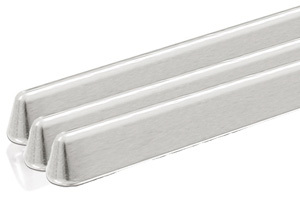 We stock SN100C solder bar made under license by Stannol. We stock Inventec Solder Paste in 63/37, SN62 (2% Silver) and SAC305. 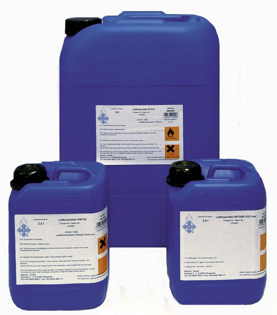 We stock MG Chemicals 63/37, SAC305 Solder Paste syringes, Rework Flux Gel and Flux Pen. STANNOL Crystal 505. The soldering wire Crystal 505 is based on a low-halogen activated "No-Clean" flux. It has been developed for high requirements for conventional soldering and for soldering SMDs in industrial production and for repair and resoldering. It combines high activity and good flow characteristics with electrically safe residues. Available in diameters from 0.5 to 1.2mm. 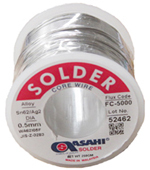 This soldering wire can be used for manual and machine soldering shows its strengths where the wettability is not always optimal and the work has to be done quickly. Crystal Technical Data Sheet. HS10 flux is a natural no-clean high activity flux. It has been developed for high quality requirements in industrial manufacturing and for fast repair and resoldering. TSC305 (Sn96.5Ag3.0Cu0.5) is a lead-free solder according to ISO 9453:2006 (alloy number 711) which can replace eutectic or almost eutectic tin/lead or tin/lead/silver alloys. It is manufactured from pure metals and has been developed to eliminate the use of tin/lead alloys in all existing production processes in electronics manufacturing and guarantees a lead-free soldering process. STANNOL CRYSTALL 511. The wire flux Crystal 511 is a well activated flux based on synthetic resins. it combines high activity and good flow characteristics in an outstanding way with small amounts of solid and electrically safe residues. 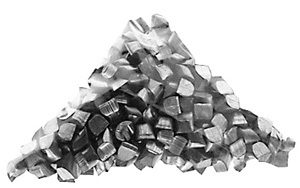 Currently stocked in diameters from 0.5 to 1.2mm. The Crystal 511 can be used for manual and machine soldering in the area of electrical engineering and electronics. Crystal Technical Data Sheet. ROHS Statement. REACH Statement. TC (Sn99.3/Cu0.7) is a low cost lead free alternative. Melting point 227°C. SN100C is a silver-free, eutectic lead-free solder, based on Sn99.3Cu0.7 and conforms to ISO 9453:2006 (alloy number 401) with micro-alloyed additives (<500ppm). The SN100C has been developed and patented by NIHON Superior. ARAX soldering wire shows good wetting and flow characteristics on the following metals: brass - bronze - cadmium - nickel - copper - silver - iron - steel - spring steel - lead - tinplate- some stainless steels - zinc and zinc-plated surfaces - galvanised metal surfaces -many resistance wires. Flux residues must be removed after the soldering process. 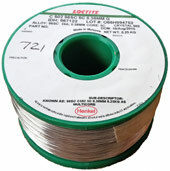 ALUSOL soldering wire contains a flux specially matched to soft soldering of aluminium. The soft solder joints with the ALU-SOL soldering wire are not as strong as brazed joints; therefore they must be formed so that they are only loaded by shear stress if possible. 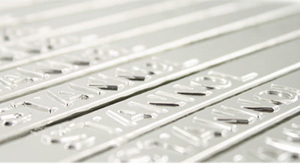 STRATOLOY 63/37 solder bars are made to a Stannol specification with significantly lower impurities in comparison with alloys which are manufactured according to S-Sn60Pb40E or S-Sn63Pb37E (ISO 9453:2006). The bars are manufactured from ultra pure metals. Due to a special treatment, possible impurities (oxides, sulphides) which can still be present in other alloys are removed from the STRATOLOY alloy. ECOLOY TSC305 (Sn96.5Ag3.0Cu0.5) is a lead-free solder according to ISO 9453:2006 (alloy number 711) which can replace eutectic or almost eutectic tin/lead or tin/lead/silver alloys. The ECOLOY TSC305 alloy is manufactured from pure metals and has been developed to eliminate the use of tin/lead alloys in all existing production processes in electronics manufacturing and guarantees a lead-free soldering process. 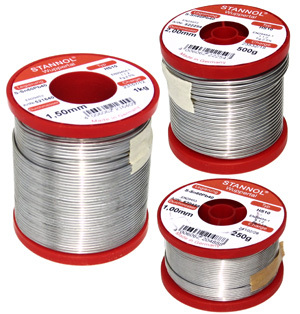 STANNOL SN100C is a silver-free, eutectic lead-free solder, based on Sn99.3Cu0.7 and conforms analogous to ISO 9453:2006 (alloy number 401) with micro-alloyed additives (<500ppm). The SN100C has been developed and patented by NIHON Superior, licenced and produced by STANNOL. SN100CE is copper free type for top up of Solder Baths due to elevated copper levels. Stannol WF300S is a No-Clean water-based and is suitable for use everywhere organic solvents are used. Due to an increased solid content, it is possible to reduce the volume to be applied so that the water as solvent can also be well evaporated in the preheating of the wave soldering machine. The flux WF300S has been specially developed for use in a wave soldering system with spray fluxer. Can be used with or without nitrogen. Stannol EF270 is low residue, no-clean flux from the Easy Flux range. 2.7% solids. ORL0 classification. Stannol X32-10i is a halogen free activated No Clean Flux shows a relatively wide process window. The Flux X32-10i is well suited for use in a spray fluxer.